Insider-trading scams can be hard on a friendship. 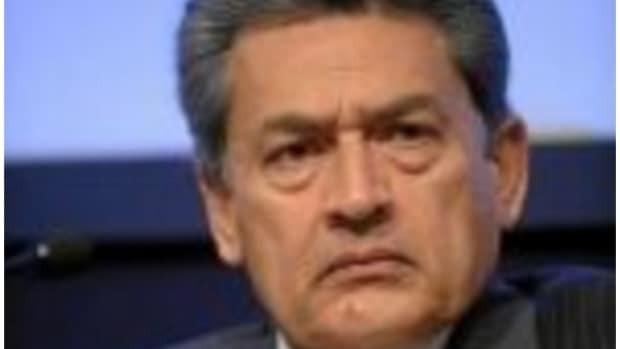 For instance, we doubt that Rajat Gupta has many warm feelings left for his old buddy Raj Rajaratnam. Nor, it seems, is he feeling particularly kindly towards he and Raj&apos;s partner in private equity firm New Silk Road Partners. Even facing two years in prison, the former McKinsey & Co. chief does not care to be screwed on a business deal. Which is what he says is happening, re: New Silk Road and his old buddy Parag Saxena. At issue is an India-focused private-equity firm called New Silk Route Partners Ltd. that Mr. Gupta founded with Parag Saxena in 2007. While facing charges of insider trading, Mr. Gupta at Mr. Saxena&apos;s request distanced himself from the firm by giving up control of his voting shares, according to the suit, which was filed Thursday. Mr. Gupta also gave up the title of chairman but retained the ability to appoint a member of the firm&apos;s two-person board, the lawsuit says. The problem came when Mr. Saxena attempted to block Mr. Gupta&apos;s nominee to the board in March in an effort to gain "unfettered control over" New Silk Route, the lawsuit says. Mr. Saxena, who serves as chief executive at New Silk Route, declined to comment through a company spokesman. The spokesman said that while New Silk Route itself isn&apos;t named as a defendant in the suit, it believes the lawsuit is without merit. He added that New Silk Route "remained committed to severing all ties with Mr. Gupta."